Once the well has been drilled and the wellbore has been tested for integrity, the site is prepared for well stimulation through hydraulic fracturing. Various surface facilities and mobile equipment including fracture fluid storage tanks, sand storage units, chemical trucks, blending equipment and pumping equipment surround the wellhead on the lease. 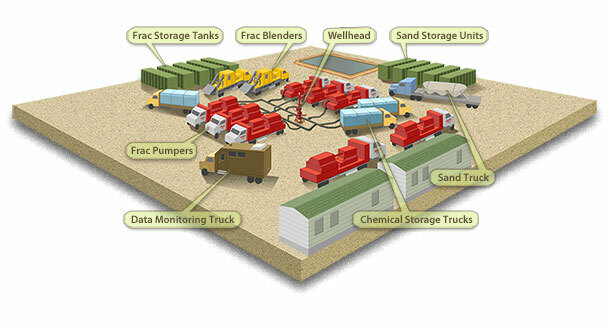 The hydraulic fracturing process is monitored from a single truck often referred to as the Data Monitoring Van. The Data Monitoring Van will monitor and record the rate and pressure at which the fracturing fluid is pumped down the wellbore, the rates of the necessary additives present in the fracturing fluid and proppant concentration. Prior to and during the hydraulic fracturing job, you can expect to see an increase in heavy traffic on the roads surrounding the lease, as required equipment and services, such as graders, water trucks, the service rig and other heavy equipment is transported to and from the site. Once the hydraulic fracturing program and related operations are completed the traffic should decrease substantially. There is a range of hydraulic fracturing techniques and several different approaches may be applied within a specific area. Hydraulic fracturing programs and the fracture fluid composition vary based on the engineering requirements specific to the formation, wellbore and location. A typical hydraulic fracture program will follow the stages below. Spearhead stage: Also referred to as an acid stage, it is generally a mix of water with diluted acid, such as hydrochloric acid. This serves to clear debris that may be present in the wellbore providing a clear pathway for fracture fluids to access the formation. Pad stage: A batch of carrying fluid without proppant that is used to break the formation and initiate the hydraulic fracturing of the target formation. Proppant stage: During this stage a mixture of water and sand (i.e. proppant) is fed into the wellbore. The proppant is composed of non-compressible material, such as sand, that will be carried by the fracture fluid into the formation and deposited. The proppant will remain in the formation once the pressure is reduced and ‘prop’ open the fracture network. Thus, maintaining the enhanced permeability created by the hydraulic fracture program. Flush stage: A volume of fresh water is pumped down the wellbore to flush out any excess proppant that may be present in the wellbore.